This book felt a little young to be, but at the same time is really well done. It is the perfect start to a series that is reminiscent to other big YA books, but can be read to younger kids without being too scary. The idea is not super new, but I love the way it is handled. Also, the books leaves at a place where the door is wide open for so much more to come! It has really been years since I read this book. But, I remember that this is what started me reading like a compulsive, crazy person. It's deep for such a young person to read. After a worldwide famine, a population law is enacted in America. Only two children are allowed per couple, any other children are counted as illegal, or shadow children. 12-year Luke is a shadow child, he has lived his entire life on his family's farm hidden from the neighbors and the population police. He and his family live in fear every day of someone finding him. When a housing development is built behind his property, Luke loses the last freedom that he has, as he is forced to stay in his house or risk discovery. A few weeks after the development is built Luke sees, somebody else inside one of the houses, and all the neighbors are gone. Eventually Luke takes a chance a discovers another shadow child, Jennifer Talbot. Jen is excited to meet Luke, and shows him a network she has developed to communicate with other shadow children, and organize a protest against the population law. Luke is excited to meet Jen, but intially disbelives that Jen will actually follow-thru. When Luke finally realizes that Jen plans to have the protest and risk her life and the lives of several other shadow children, he is forced to make a decison. In the end both Jen and Luke's decisions have far reaching impact and change their family and their lives forever. This book is definitely thought-provoking and provides a excellent opportunity for discussion on population control and the extent of a government's involvement in it's citizen's lives. An excellent read and a great What If? book. 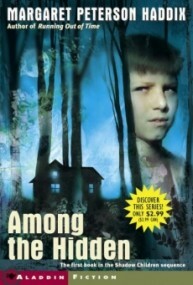 Among the Hidden is a great book by Margaret Peterson Haddix a prestigious author. It is about a young boy named Luke lives in a world controlled by the government. A food scare convinced them that the population needs to be reduced. Each family is only allowed 2 children and Luke is an illegal third child. He cannot go to school for fear of being caught. He is lucky because he lives in a forest where he can still play outdoors. His luck soon runs out. Construction workers start tearing down the forest and Luke is forced to be inside all the time. One day as Luke was looking out of the vents in his upstairs room, he sees a face in the window at the house next to his. And the other two children left with their parents before that. If you enjoy suspense and action, I extremely recommend the series. There are seven books so get reading! My teacher posted excerpts of each chapter on my schooling home page (i'm homeshooled) and i was supposed to finish at the end of the quarter, but i finished two weeks ago, i couldn't stop reading it. i had to force myself off, her adjectives were just like watching a movie. i can't wait to read the rest of the series. A fun, thrilling, book for all ages, among the hidden. One of many great books created by Margaret Peterson Haddix . Description of fanticy is a captivating experience. A page flipper full of exitment is what could be found in the insightful series. Luke Garner one of the major charactor of the book is an illegal third child whos spent most of his childhood in hideing. He soon comes to find that Jen a nabor who is also an illegal third child fighting for her rights at a rally that might take away her life,but never her freedom. This was such a good book! It had a good storyline to it and made me be thankful for who I am and glad that I don't live where ever he lives!!!!!! I have to give all the credits to the author!She really can write a GOOD book!!! I haven't read Among The Brave,Among The Enemy, or others that she wrote, but I will surely read them! I am a fifth grader, and I just completed Among The Hidden by Margaret Peterson Haddix. When I was reading I kept asking to myself, "would I myself have own the guilt to have confidence in the rally of that sort?" It's something we all have our personal thoughts about. However, wouldn't it be a nice trate to have. In life ther's going to be ups and downs, positives and negetives, but that's life, and that's how it's going to be. Maybe if main character Luke, would have had the will, the ending would have a different result.